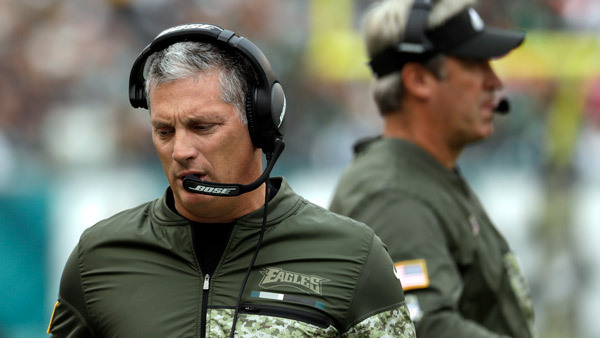 Philadelphia Eagles defensive coordinator Jim Schwartz is expected to be a favorite -- if not the favorite -- for the New York Giants' head-coaching job, sources told ESPN's Adam Schefter. The Giants, who are 2-13 and vying for the No. 2 pick in the NFL draft entering Sunday's season finale against the Washington Redskins, fired coach Ben McAdoo after Week 13. New York has since been led by Steve Spagnuolo on an interim basis. Schwartz is expected to interview with the Giants in the next week, while the Eagles -- with an NFC-best record of 13-2 -- are on the bye heading into the postseason. Watch the report from Jamie Apody on Action News at 5:30 p.m. on Dec. 29, 2017. Giants owner John Mara said the team wants to hire an experienced coach, and Schwartz would qualify. He coached the Detroit Lions for five seasons, with his tenure ending in his dismissal after the 2013 season. Schwartz was 29-51 in Detroit. He inherited an 0-16 team and had Detroit in the playoffs by his third season in 2011. Four of his five seasons, though, ended with losing records. In two seasons in Philadelphia, Schwartz has made significant strides with the Eagles defense. Their unit is ranked second, behind the Minnesota Vikings, in the conference, both in totals yards and points allowed. The Giants last week hired Dave Gettleman as general manager to replace Jerry Reese, who was fired on the same day as McAdoo. Gettleman is a 30-year NFL veteran who spent four seasons as the Carolina Panthers' general manager and 15 seasons as a personnel executive in the Giants organization.